Arunachal’s rivers including Siang drying up after land slide in China. Ninong Ering wrote letter to Sushma Swaraj and Arun Ram Meghwal. Around 6,000 people have been evacuated following a landslide in Tibet that blocked the flow of one of the region’s key rivers, China’s emergency services said on Thursday, according to a report published in seattletimes. A barrier lake was formed on the Yarlung Tsangpo, the head water of India’s Brahmaputra River, following the Wednesday morning collapse of a cliff in the deep valley through which the river flows, the local emergency response bureau said in a report carried by state media. The landslide struck near a village in Menling County and water in the lake had risen to a height of 40 meters (131 feet) by Thursday, the bureau said. 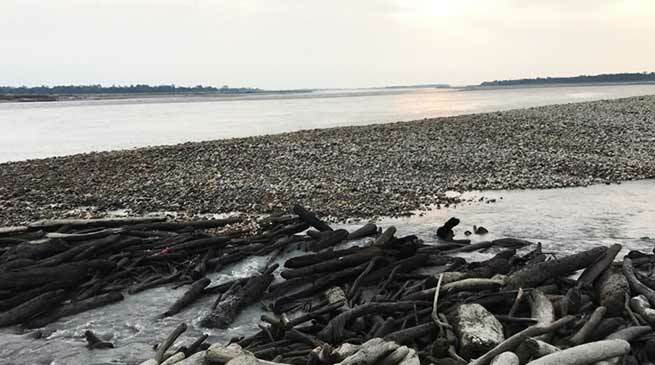 The situation of rivers along Tuting, Yingkiong and Pasighat in Arunachal Pradesh is grim. These places are drying up rapidly due to the blockade of Yarlung Zangbo in China. It will pose big threats to downstream dwellers and will ruin their lives forever. Wrote to @SushmaSwaraj Ji and @arjunrammeghwal Ji on the issue of blockade by Yarlung zangbo which is leading towards drying up of rivers in Arunachal. Attached are pics of letter and drying rivers along Tuting and Pasighat area. When this news reached to India specially in Arunachal Pradesh, Member of Parliament from Arunahal, Ninong Ering wrote a letter to External Affairs Minister Sushma Swaraj and MoS Water Resources Arun Ram Meghwal and informed them about the unfortunate situation that has developed in the state of Arunachal Pradesh. As per the latest information received from the Ministry of Water Resources of China, landslides have blocked the Milin section of the main stream of Brahmaputra River/ Yarlung Zangbo River (about 80 km downstream from the Yarlung Zangbo River to the Nuxia Hydrological Station for flood reporting in India) from late October 16- Early morning of Oct 17, 2018, which will have an impact on the water situation of the lower reaches of the Yarlung Zangbo River, stated the Ering’s letter. The Chinese side is paying close attention to the blockage of the Yarlung Zangbo River. If there is further information, they must notify us in time and the Government must proactively engage with them on this issue, Ering’s latter informed. Ering requested both the union ministers to intervene in the matter at the earliest and protect the land, water, forest and precious lives of Arunachal Pradesh. Make a recurring commitment to support the Arunachal24 as a single contribution as and when you feel like it – your contribution helps to support independent investigative journalism. Independence means we can pursue a story without fear of where it might take us. It means we’re free to ask the questions no one else is asking, to hold power to account and to bring about real, positive change. With your’s help, our journalism can change the story. Help to change. Copyright © 2019 Arunachal24.in. All rights reserved.